COMMONWEALTH GAMES: Did you watch the Commonwealth Games opening ceremony last night? Chances are, you got a glimpse of a former Grafton champion. 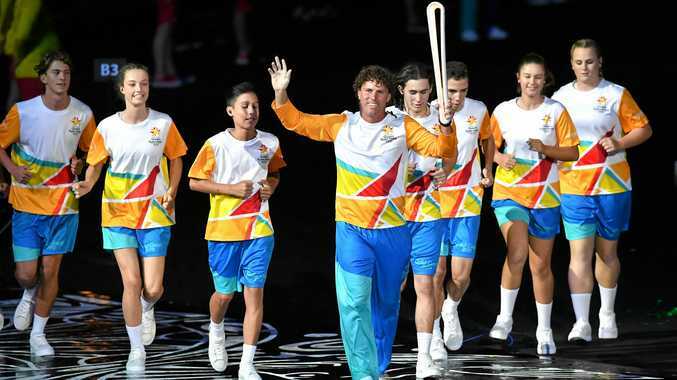 One of the most successful athletes to ever come out of the Jacaranda City, and a three-time COmmonwealth Games gold medallist, Brent Livermore was front and centre during the ceremony. After earlier carrying the Queen's Baton through the streets of Bellingen in February, Livermore was again recognised for his contribution to Australian sport when asked to carry the baton during the official ceremony. Livermore accepted the baton from Australian netball stalwart Liz Ellis, and carried it around Carrara Stadium, before handing it over to final recipient and Gold Coast golden girl Sally Pearson. It was a proud moment for the local Grafton Hockey Association, and president Peter Fysh, who have a field named after the former Australian captain. "It is a proud moment for us,” Fysh said. "It is great to see all athletes get the chance to carry the baton, but for Brent and his family that would have been a really big moment. "You could see he was stoked to be there on centre stage and hand the baton over to Sally Pearson, she is a legend in her own right. It would have also been a special moment for Brent's parents, Sue and Barry, who still dedicate their time to supporting the local association. It has been a tough 12 months for the Livermore family after Barry was felled by a stroke on-field during the Hockey Men's Masters NSW State Championships last year. But after a long road, things are beginning to turn around for the local champion, and it would have been a proud moment to see their son on centre stage. The timing of Livermore's recognition at the Commonwealth Games could not have come at a better time, with the local hockey season taking to the fields for the first time in 2018 this weekend. Junior hockey will begin in the Under 11, Under 13 and Under 16 divisions tonight, while the junior girls and women will kick off on Saturday followed by the men's competition on Sunday. While the association has lost a few numbers from last seaosn, Fysh said it was not too much of a concern. "Things are going really well, we are cruising along into the season,” he said. "The committees have been working hard to get the draws and the behind the scenes work completed.